The Zimbabwe Japan Karate Association Shotokan team scooped a bronze medal at the JKA/WF Africa Cup held in Johannesburg, South Africa over the weekend. 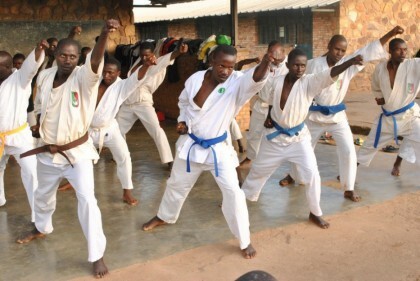 Zimbabwe came third in both the Kata and Kumite categories during the competition that also saw seven other African countries namely South Africa, Angola, Botswana, Namibia, Uganda, DRC and Egypt taking part. South Africa came first in both the Kata and Kumite while Botswana finished second in the Kata. In the Kumite Angola settled for second place in the tournament, which was open to JKA Shotokan practitioners only. Allan Sibanda, Never Mutizwa, Tapiwa Matsivo, Calvin Jackson and Wellington Mutimurefu, all from Gweru Sports Club represented the country in Kumite. The Kata team comprised Mutizwa, Matsivo and Mutimurefu. The teams were under the tutelage of Senseis Gibson Sangweni and Phibion Mudzenda. Sibanda was delighted saying the teams performed beyond expectations. “Given the financial constraints and short preparations we had, this was a massive performance. We will take this as an important learning experience,” he said. Grading and training sessions were also held prior to the competitions. The sessions were conducted by senior instructors from Japan, Senseis Okuma Koichiro (5th dan) and Mori Toshihiro (7th dan) while Mudzenda (6th dan), Sangweni (6th dan) and Allan Chihaka (3rd dan) were all successfully graded. JKA Shotokan is one of the oldest and most popular karate styles across the world. In Zimbabwe, the style celebrates 50 years of existence this year.